The first question we should ask is “which land”? We find the answer in the previous two verses. At that time, Abram was dwelling “in the land of Canaan”. However, where is “this land”? From the previous two verses, we find that Abram, during this time, was dwelling in “the land of Canaan.” This was the territory situated between the Great/Mediterranean Sea and the Jordan River. It was so named because the descendants of Canaan, who was the grandson of Noah (Genesis 10:1,6), lived there. Therefore, the land of Canaan was “the promised land”. At a later time, when Abram was living once again in Canaan, the Lord told him, “And the LORD said unto Abram, after that Lot was separated from him, Lift up now thine eyes, and look from the place where thou art northward, and southward, and eastward, and westward: For all the land which thou seest, to thee will I give it, and to thy seed for ever” (Gen. 13:14-15). In Genesis 26:1-4 we see God repeating the land promise to Isaac and then to Jacob, his son in Genesis chapter 28. Genesis 15:18 (KJV) – “In the same day the LORD made a covenant with Abram, saying, Unto thy seed have I given this land, from the river of Egypt unto the great river, the river Euphrates”. Obviously that is a much larger area than just the land of Canaan. This portion of land goes all the way to the Euphrates River. Now please note that the “river of Egypt” was not the Nile River. It was a stream or brook that flowed near the southern border between Canaan and Egypt. You can verify this fact by referring to various Bible commentaries. Is there any scriptural evidence concerning the promise to give the land of Canaan to Abraham’s offspring? Yes, there are three lines of proof which clearly show that such a promise was fulfilled over 3,000 years ago! First, in the Book of Joshua there are plain statements that declare that God did, in fact, fulfill His land promise. Thus, the addition of three additional cities inside Canaan would be proof that God had fulfilled His land promise (Deu. 19:1,2). Well were those three extra cities of refuge established? They certainly were! Joshua 20:1-7 reveals this fact. The three additional refuge cities were added, proving that the land promises was fulfilled. Why? Because the fulfillment of that promise was required before those other cities would be added. Third, Levites of Nehemiah’s generation (444 B.C.) praised God in prayer, saying that He made a covenant with Abraham to give the land of the Canaanites and other nations to his descendants. In the clearest terms imaginable, the Levites said to Jehovah, “You have performed Your words, for You are righteous” (Nehemiah 9:8,9). Again more scriptural proof that the land promise made to Abraham was fulfilled. Really we can stop right here! We do not have to go past the reign of Solomon (B.C. 971-931). God’s land promise was fulfilled – totally. However, didn’t God say that He would give the land to Abraham’s descendants forever? This is what we read earlier in Genesis 13:15. “Forever” means “forever” right? Well no, not in the context of Genesis 13:15. Under God’s covenantal system, all promises come with “strings attached”. The word “forever” simply means throughout the complete duration of a definite period. The land promise was conditional. It was dependent on obedience on the part of the children of Israel. The Lord warned them that if they did not obey Him, then He would pluck them from off the land of Canaan. The Lord would scatter them from one end of the earth to the other (Deuteronomy 28:15,63,64). Because of their rebellion against the Lord the Israelites forfeited the right to live in the land (Deuteronomy 30:17,18). Yes, the Lord God kept His Word long before Jesus was born. God kept His promise that He made to Abraham. The scriptures clearly reveal that the promises were fulfilled shortly after the Lord made them. To believe that these promises were not fulfilled until the 20th century does not make sense based on the clear reading of scripture. God is a faithful God that keeps his covenants. So the land promise that God made to Abraham was fulfilled – over 3000 years ago! On top of all that, there are a couple of other facts. 1. In the prophets we find statements that Israel violated the covenant. This abrogated the agreement, making it null and void, and therefore we need not expect a tangible fulfillment of Israel returning to the land. 2. In apostolic times the old covenant, of which the Abrahamic covenant is a part, was already ready to disappear, being obsolete. To look for ethnic Israel to return to Canaan, therefore, is to revert to the old covenant. 3. The land, and Israel’s possession of it, were typical (as was just about everything in the Old Testament). In this case, we see in a figure the inheritance by the saints of all the blessings that are in Christ for God’s children. To look for an actual return of the nation of Israel to Canaan is to prefer the type over the anti-type. Robert – excellent summary of the real issues! A study of the covenants goes along way in understanding the scriptures. I believe it allows us to rightly divide the Word of God. Thanks for your comments and for stopping by this site. I agree with your premise, but think there is more to be said. Hebrews 11 says, 8 By faith Abraham obeyed when he was called to go out to a place rthat he was to receive as an inheritance. And he went out, not knowing where he was going. 9 By faith he went to live in the land of promise, as in a foreign land, living in tents with Isaac and Jacob, heirs with him of the same promise. 10 For he was looking forward to the city that has foundations, whose designer and builder is God. So, Abraham was promised “land” yet when he was on the dirt of “Israel” he believed, by faith, that God really was referring to an eternal place of God’s people. That is the real fulfilment of the promise of “land”. And, yes, unsaved Israel was not promised a political kingdom on earth in the “land”. They were not even promised earthly benefits of “land” if they obeyed. What happened to Enoch, a man who kept the law? Genesis 5 24 Enoch walked with God, and he was not,3 for God took him. 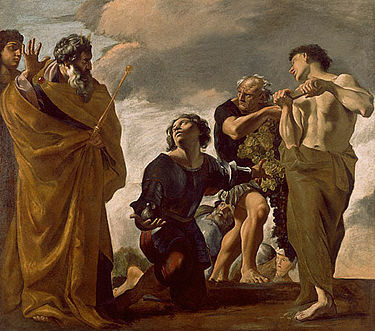 Enoch received the blessings promised to Abraham! Eternal life. Heaven. A city that has foundations, whose builder and maker is God. That is it. One Lord, One Faith, One Baptism. Yes Scott there certainly is more to be said – and I believe you said it quite nicely! Thanks for your comments – they are well received. Thanks for this fantastic summary. It shows very clearly that the Bible says God has already fulfilled his promise of physical land for Abraham’s physical descendants. Therefore, we should not insist that God is somehow obligated to reinstate a physical land for literal, physical descendants of Abraham to inherit in the future. Of course, there are many important future promises for “children of Abraham” in the New Testament. But these New Testament promises include Gentiles! In Galatians 3, we are told that Gentiles are included as “children of Abraham” through faith in Christ Jesus. So our status as children of Abraham in the new covenant rests not upon the basis of a physical genealogy. It rests upon the promise of God through faith in Christ Jesus. From my perspective, I’m not trying to say that Gentiles “replace” physical Israel. I’m only saying that the Bible indicates that there is now a new chosen people and holy nation of God in the new covenant. In Exodus 19:6, we see how this was originally true for Abraham’s physical descendants of promise under the Old Covenant. In 1 Peter 2:9, we see how God is making the same promise true in a new and different way for the people God calls “descendants of Abraham” under the New Covenant. In this New Testament, physical Jews and physical Gentiles alike – all who have a living faith in Christ Jesus – are now “children of Abraham”. The church is God’s new Israel under the new covenant in Christ Jesus. Why do so many faithful followers of Jesus miss this? I think it comes back to an unwavering commitment to strict adherence to a hermeneutic which God never commanded. If we pause to think about it, when God intentionally keeps something hidden as a mystery from his people, speaking of it in language which is to become known to them only later after revelation, we cannot afford to use a hermeneutic that limits our interpretation based upon how the original readers would have understood the text when it was first written. When God intentionally ‘holds back’ some of the full knowledge of his plan even from his own prophets, (1 Peter 1:10-12), we cannot even expect a hermeneutic which limits itself to the boundaries of human authorial intent to reveal God’s full picture to us. Only in retrospect, seen through the lens of the life, death and resurrection of Jesus can these scriptures be understood properly. So, if we aren’t careful, these (well intentioned but ultimately self-imposed) rules of interpretation can cause true believers in Jesus to wear interpretational “blinders” when reading prophecy. We can accidentally force ourselves to read the Old Testament texts similar to the way the Jews read them thousands of years ago, expecting an earthy kingdom for the physical descendants of Abraham. God has revealed the mystery. He doesn’t want us to read the text exactly the way the average Jew did thousands of years ago. He wants us to see the full picture in Christ! He expects the “blinders” to now be removed!